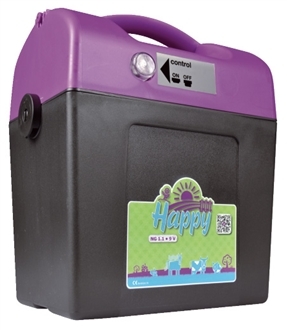 The Happy 9v Purple will power between 1 km-2 km depending on the condition of the fence. The big advantage of this energiser is the battery is fairly light and lives inside the bottom of the energiser. There is no need to carry heavy 12v batteries across a muddy fields for them to be recharged. A padlock can also be used to lock the handle of the energiser to a secure fence, making it harder for thieves. The Happy 9v energisers use the same intenal components as the Equistop range so you can have a bit of fun knowing you have got German reliabilty.